The 2009 chevrolet corvette electric vehicle qualifies for a federal tax credit of up to $7,500, effectively reducing the net base price. Once hailed as America's only true two-seat sports car, for 2009 the Chevrolet Corvette continues to offer driving enthusiasts the most bang for the buck, running neck-and-neck (and in some cases surpassing) exotic cars costing up to four times as much – or even more. No where else but in America can you find a sub-$50,000 sports car delivering 430 horsepower while returning an EPA highway fuel economy figure of 26 miles per gallon. Although not as light or nimble as the Porsche 911, the Corvette's luxurious interior and comfortable ride make it perfect for daily commutes or long weekend getaways. For those willing to spend a lot more money for even more performance, there's the 505 horsepower Z06 and, beyond that, the optional ZR1 Performance Package delivers track-ready supercar status. If you love your cars American and iconic, the 2009 Chevrolet Corvette is a sports car purist's dream come true. Drivers experience awesome V8 power, amazing handling and an interior filled with more creature comforts than some luxury cars. Though its handling is admirable, fans of lighter, more nimble sports cars may find the Corvette's size ponderous in tight turns and tight spots. A new, lower-priced LT1 Convertible joins the fleet, while the LT2 version receives as standard a power operated top. New features for the 2009 Corvette include steering-wheel audio control, optional Bluetooth connectivity, a new variable steering ratio and, on the Z06, a new 10.5-quart dry-sump lubrication system. The Z06 and Corvette Coupe also receive a power hatch pull down. 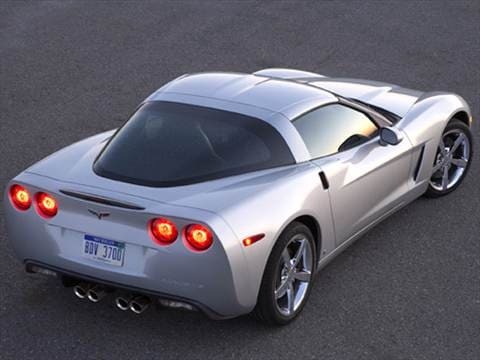 As you would expect, the 2009 Chevrolet Corvette is a terrific driving experience. The 6.2-liter V8 delivers abundant power throughout its speed range, a fact the driver is reminded of with even the slightest touch of the accelerator. There is no need to work hard to "handle" this muscle machine. Instead, it steers with ease and precision, dealing with twists and turns as effortlessly as imaginable. All three of the suspension packages – base, Magnetic Ride Control and the Z51 package – are notably enhanced from the previous-generation systems. In the sport mode the Corvette grabs the pavement with tenacity, and in the touring mode it soaks up road harshness like a large luxury sedan. Chevrolet's latest short-throw six-speed manual transmission makes the shifter in past Corvette models feel like something pulled out of a 1966 Chevy pickup. Keep your keys in your purse or pocket – when you approach the car, you simply reach for a touch-panel in the door handle and the vehicle starts up with the press of a button. The Corvette's clean, uncluttered interior is executed using the highest quality parts and trim, bringing it into world-class contention. A handsome Custom Leather-Wrapped Interior Package was added last year and carries over largely unchanged. It adds two-tone leather inserts to the dash and console area, a nice touch for those who prefer to customize their rides. The Corvette's seats are surprisingly supportive yet not so snug as to cinch the driver in place. Interior sound levels are about average for this class, which means the Corvette's cabin can still be noisy at highway speeds. The 2009 Chevrolet Corvette bears a strong family resemblance to previous Corvettes dating back to the ground-breaking 1968 C3 design, although the subtle changes to the exterior make this sixth-generation car a different animal than its predecessors. Overhangs both front and rear are noticeably shorter and the overall look is less boy-racer and more sophisticated sports car. A flush-fitted set of headlamps molded to fit the curving hood line set off the front of the car, a radical departure from the pop-up headlamps gracing the Corvette's design language since 1963. A large removable body-colored roof panel is standard and can be ordered with tinted glass or in a package that includes one of each (not available on the Z06). The 2009 Corvette features a 6.2-liter V8 engine, six-speed manual transmission, traction control, limited-slip rear axle, four-wheel anti-lock disc brakes (ABS), xenon headlamps, AM/FM stereo with CD/MP3 capability, auxiliary input jack, XM Satellite Radio, OnStar, color-keyed removable roof panel, dual-zone air conditioning, Driver Information Center (DIC), keyless access with push-button starter, leather seats, six-way power driver's seat, cruise control, leather-wrapped tilt steering wheel and 18- and 19-inch front and rear alloy wheels, respectively. The Z06 adds a race-inspired 7.0-liter V8, revised front end, wider rear fenders, 18-inch front and 19-inch rear ten-spoke wheels and a firmer suspension. Options include a paddle-shift six-speed automatic transmission, front side-impact airbags, Head-Up Display (HUD), Bose audio with six-disc in-dash CD/MP3 player, power tilt and telescoping steering wheel, Turn-by-Turn and DVD navigation, the Z51 Performance Package, Magnetic Selective Ride Control, dual-mode exhaust system, transparent roof panel and polished alloy wheels. Also available is the Custom Leather-Wrapped Interior Package, which adds padded door armrests, custom embroidery on the dash and headrests and two-tone leather-wrapped pieces to the upper and lower instrument panel, door pads and seats. Although there is no denying the pleasure a 430-horsepower (436 horsepower with the optional dual-mode exhaust) V8 delivers, with the Corvette you also get a certain lack of refinement. The 6.2-liter LS3 small-block V8 feels gruff at idle and roars loudly when pressed into action. It's a purely American feel that instantly takes one back to the late 1960s muscle-car era. Porsche and Jaguar lovers will probably never love this engine, but they can't easily overlook its tremendous performance potential, either. The 2009 Corvette Coupe's Manufacturer's Suggested Retail Price (MSRP) starts around $48,000, while the Convertible bumps the price to around $52,500. The Z06 starts just under $75,000, while the ZR1 is beyond the $100,000 mark. A wide range of competitors with similar performance and/or horsepower figures includes the Porsche 911 Carrera S at close to $85,000, the Jaguar XKR Coupe at about $88,000 and the Ford Mustang SHELBY GT500 at around $45,000. Be sure to check the Fair Purchase Price before you set out to purchase your Corvette – you'll be able to see what other buyers in your area are paying and negotiate accordingly. Even if you find yourself paying full retail for your Corvette, you can take solace in the fact that over a five-year period it rivals the Porsche 911 Carrera S in projected residual values. Great Vette with new chrome rims and tires,special paint, only 12000 miles. REALLY A GREAT RIDE VERY GOOD CONDITION.